Announcer Andy Masur in the Padres broadcast booth. When visiting teams come to Chicago, it’s always a pleasure to see a young broadcaster who began their career here before moving on to other endeavors. That’s the case with Glenview native Andy Masur. 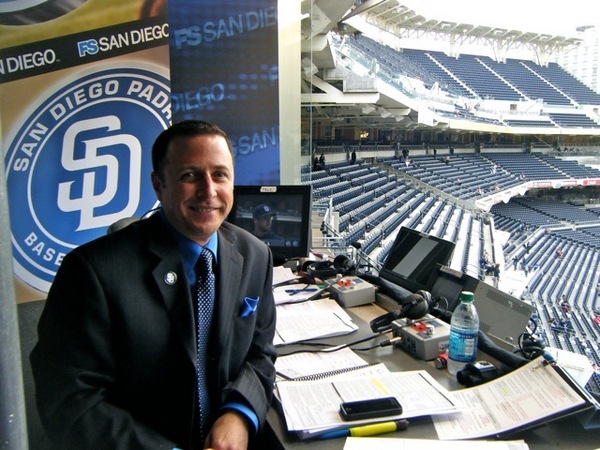 For the past six years he’s been a part of the San Diego Padres radio and TV broadcast, handling both play-by-play and pre-game. Masur was in town with the West Cast team at Wrigley Field recently. We sat down in the press box to talk about the Cubs, Padres and his broadcast roots. When Masur was with the Cubs, he worked closely with former Cubs great Ron Santo. Sometimes comedic situations happened at Santo’s expense – mostly with his hairpiece. One such occasion was in St. Louis. Masur got a frantic call from Santo looking for help with his missing toupee. It’s heartbreaking to know that the former Cubs third baseman won’t be there this summer to accept his induction into the Baseball Hall of Fame. But Masur intends to be there. Last season he returned to Chicago for the unveiling of Santo‘s statue at Wrigley Field. Masur is grateful that the Padres that have allowed him the opportunity to honor his former co-worker and dear friend. As for Masur’s present career in San Diego, he says it’s a vastly different atmosphere there – both in terms of the baseball and the fans – than it is in Chicago. It would undoubtedly give Masur’s parents, Steve and Judy Masur, a thrill to see their son broadcasting Cubs games if that were ever to happen.